On July 1, 2014 Canada will introduce the so called Canada’s Anti-Spam Legislation (CASL) – a broad set of strict regulations designed to protect Canadians against electronic communication abuses such as various types of spam, malicious software, data harvesting, promotion of products and services using misleading information and, quote: “any other current and future internet and wireless telecommunication threats prohibited by Canada’s anti-spam legislation” . The measures required by CASL go far beyond adding a small-print ‘unsubscribe’ link to newsletters. Failing to include them even once may result in receiving a fine of up to $1 million (for individuals) or $10 million (for businesses), and since the law applies to everyone sending electronic messages to Canada, it’s high time for businesses around the world to start adjusting. 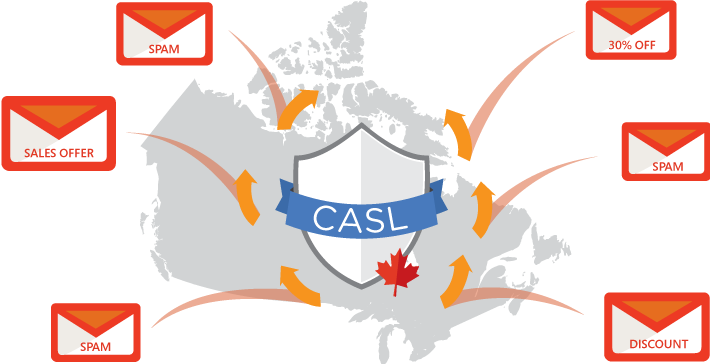 Simply put, CASL is designed to ensure that Canadian users are always given the ability to provide express and informed consent before receiving any type of commercial electronic messages (CEMs). In case of emails, this includes all which by way of content, hyperlinks or contact information advertise entering into commercial relationships, e.g. purchase of a product or service. Another requirement is that the consent should be separate and positive, which means no lumping it in with e.g. license agreements or general terms and conditions of use or sale, and no pre-checked boxes. The recipient inquired or applied for the information contained in the CEM within maximum 6 months before it is sent. The recipient published their electronic address, without expressing a wish to not receive CEMs, and the CEM is relevant to them. The recipient provided the sender with their electronic address, without expressing a wish to not receive CEMs, and the CEM is relevant to them. The sender (or person who permits the message to be sent) and recipient engaged in a business or non-business relationship within maximum 2 years before the CEM is sent. Additionally CASL introduces a 3 year transitional period starting from July 1, 2014, where consent is implied, if there is an existing business or non-business relationship between the sender and recipient, and unless the recipient at any time decides to opt out of receiving CEMs. 1. Make sure your emails contain clear senders’ identification, including full electronic and mailing contact information, valid for at least 60 days after the email is sent. 2. Provide a free and easy to find unsubscribe mechanism in all emails (e.g. opt-out hyperlink or phrase). If your company uses Exchange Server, you can use this program to automatically add disclaimers with “unsubscribe me” links to every outgoing email. 3. Make sure your emails do not contain false or misleading content, links, contact information, etc. 4. Advise your senders that they need end users’ express consent before they send an email containing any commercial or marketing information (unless any of the conditions where content is implied are met). 5. Keep records of obtained end users’ permissions and refusals to receive CEMs. 6. Archive sent CEMs in case you need to prove that they were CASL-compliant. Add personalized email signatures containing information required by CASL and including opt-out hyperlinks. Archive emails stamped with CASL-compliant information in users’ Sent Items folders. Forward emails containing opt-out phrases to person in charge of unsubscribing recipients. Block incompliant emails based on keywords or unapproved recipient lists. Remove CASL-violating keywords and attachments from emails. Auto-respond to emails your users send to Canada reminding them of the new requirements. Add unsubscribe links to emails. For more information about CASL refer to the links below. This is a good law. Canadians are programmed to not spam or try to sell their products via email.